We have visited a lot of health researchers over the last month. Clinicians and researchers are spread across the University’s sites, so we’ve focused on providing our Open Research workshops for Health Sciences researchers where they work, starting in Canynge Hall and Dorothy Hodgkin Building. We have future plans to run the workshop at hospital sites such as Southmead, to support clinical researchers in situ. The workshops cover Open Access publications and funder requirements, depositing papers and theses in Pure, Research Data Management, the data.bris repository, the Research Data Storage Facility and researcher metrics, so it’s a broad overview of how researchers can take steps be more open across the board. Plenty of questions came up, and it was really thought-provoking to hear researchers talk about their different career paths and their motivations to do research. In addition to the workshops, we were invited to talk at the Centre for Academic Primary Care’s (CAPC) monthly meeting about our process for sharing sensitive data with external researchers. This question arises not only because researchers at other institutions hear about research at Bristol, but also because of an increased requirement from funders and publishers to provide a means of access to data from publicly funded research. We often receive queries from researchers working with sensitive data and whilst the themes are mostly the same, the circumstances of each case often requires careful consideration, so it was a great opportunity to learn about the issues CAPC researchers face and discuss how we can support them. At CAPC we defined sensitive data in the context of research involving human participants. We discussed the circumstances where anonymisation is either not possible, or where anonymising would strip value from the dataset. 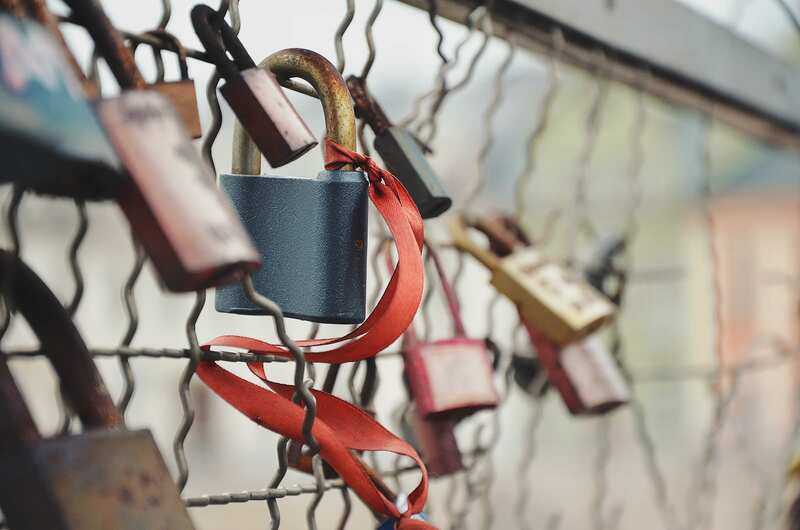 Researchers were particularly interested in the process we have for sharing sensitive data through the research data repository, data.bris, and how we have access levels specifically designed for this purpose. We talked about how decisions to share are made via a Data Access Committee, how we check researchers are bona fide, and what is covered by data access agreements. We were also able to emphasise the importance of getting consent sheets worded in a way that makes it simple for researchers to share sensitive data. Off of the back of this talk, we’ve assisted three researchers with their consent form wording and ethics applications and prevented snags further down the line at the publication stage, so it was a worthwhile visit. It also gave us the opportunity to give researchers a taster of the kinds of issues we’ll be covering at our upcoming workshops ‘Managing ethically sensitive research data: from planning to sharing,’ and interest was piqued so spaces filled very quickly! However, there are waitlists running and we will be repeating the workshop in the Autumn term and beyond. In early November 2018 the Wellcome Trust announced a new Open Access policy. It will apply to articles submitted for publication from 1st January 2020. 1. Date for implementation: 1 January 2020 – in the meantime authors should continue to comply with the current policy. 2. Wellcome Trust has joined cOAlition-S, and this is the first major funder’s policy that aligns with Plan-S.
3. The policy applies to articles that include original, peer-reviewed research, but not monographs and books. 4. All Wellcome-funded articles must be made freely available through PMC and Europe PMC at the time of publication. 5. All articles, even those where no Article Processing Charge (APC) has been paid, must be published under a CC-BY licence. a) In any fully OA journal indexed in Directory of Open Access Journals (DOAJ) + depositing in PMC/EuropePMC + publishing with CC-BY. b) In any subscription journal with a green route which allows deposit of Author Accepted Manuscript (AAM) in PMC & EuropePMC without embargo and with CC-BY. c) With any publisher with a ‘transformative agreement’ during the 2-year period Jan 2020 to Dec 2021. 7. Wellcome will no longer pay OA publication costs in ‘hybrid’ journals (subscription journal with paid OA option). 8. Where there is a significant public health benefit to preprints being shared widely and rapidly, these preprints must be published before peer review, on an approved platform that supports immediate publication of the complete manuscript, and under a CC-BY licence. 9. Wellcome-funded organisations must sign or publicly commit to the principles of the San Francisco Declaration on Research Assessment (DORA) or an equivalent. (University of Bristol has signed DORA). 10. Further information from Wellcome is awaited regarding a list of compliant preprint platforms, a list of approved Jisc Collections transformative OA agreements, and information on how to check if specific journals are compliant with the policy. The new policy and FAQ can be found on the Wellcome’s Open Access policy page. Author Alex ClarkePosted on March 12, 2019 March 25, 2019 Tags ERC, Open access, Plan S, UKRI, Wellcome TrustLeave a comment on What is Plan S? 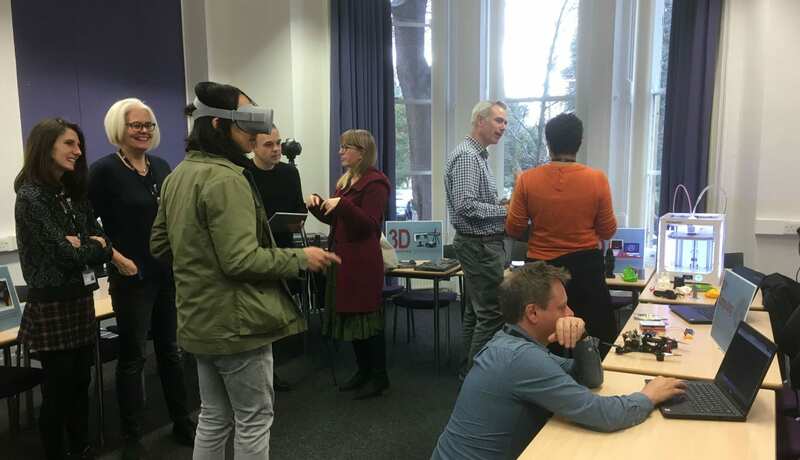 Recently, the Library Research Support team hosted two drop-in events to showcase some of the digital technologies that have potential for use by researchers in the Arts Faculty. We wanted to explore how researchers might apply the different technologies to their own projects and to discover which they envisaged as being most useful, in order to inform planning for future developments in our Library service provision. One of the technologies displayed was 3D digitisation. 3D digitisation can be achieved either by scanning an object, or by photogrammetry: a technique where many photographs are taken of an object and complied into a 3D representation by specialist software. The 3D representation may then be viewed on a screen, where it can be rotated to show all angles, or viewed in virtual reality, or printed in 3D. A demonstration of 3D printing was in progress during the event and visitors saw and handled a variety of printed objects. Printed 3D objects allow tactile engagement with the subjects of research and may be used for study in order to preserve fragile originals, for experimentation, to demonstrate relative sizes, as models to cast to produce a facsimile, or for engagement or impact activities. The DIY computing table featured a Raspberry Pi (a single-board microcomputer) and an Arduino (a programmable circuit board, or microcontroller, with the software to program it). These can be used for a variety of activities, including data visualization, automation, or controlling other devices, such as the Arduino-controlled drone also on display. There were examples of connectors and boards on which a microcomputer and components could be mounted, as well as a humidity sensor and a barometer, as examples of sensors that could be connected to a microcomputer. Visitors to the event saw two examples of 360-degree video cameras, which may be used to record, for instance, performances, events, interiors or landscapes. 360-degree footage can be shown through a virtual reality headset, or alternatively on computers or mobile devices. Such videos may form research data or be a final output of research. Our virtual reality headsets proved to be the most popular draw of the events. Visitors experienced VR representations of historic sites and interiors and watched 360-degree videos through the headsets. Great excitement (not to mention a touch of motion sickness) was apparent in those who travelled to Everest Base Camp in VR! VR may be used in research to study social situations, to explore environments, to watch performances, to view exhibitions or in training applications. Some of the researchers at the event talked to us about how reconstructing historical interiors would be useful in their work and there were also conversations exploring potential educational uses of VR. As part of their visit to the event, researchers were asked to complete a survey to help us gauge interest in the different digital technologies and we will use this feedback to inform future planning. If you did not attend the event, but might be interested in using digital technologies in your research, we would be glad to hear your views via our survey. Look out for a similar event for Social Scientists coming soon. The University of Bristol has recently taken out membership of Modern Languages Open, https://www.modernlanguagesopen.org/, an open access platform from the University of Liverpool Press, publishing peer-reviewed research from across the modern languages, with content updated on a continuous basis. Articles will be open access immediately on publication (gold open access) for a comparatively small charge which, for RCUK-funded Bristol authors, will be covered by our membership. Other authors may request a waiver of the fees. MLO offers a welcome alternative non-commercial model of open access funding. It is produced in partnership with the University of Liverpool Library and is partly supported by the Liverpool University Press Authors Fund, with the result that gold open access publishing can be offered to authors at a more manageable cost than is charged by most mainstream academic publishers. Bristol also supports the not-for-profit open access publisher, Open Library of the Humanities, which is funded by an international consortium of libraries and has no author-facing open access charges. Bristol Research Data Service recently hosted a Library Carpentry workshop in collaboration with colleagues at the University of the West of England and the University of Bath – read on to find out what it was about and what’s happening next. Library Carpentry is a set of software skills lessons created by librarians, for librarians, covering a variety of subjects including Git, SQL, Python, and using the Unix command line. The course materials are developed and maintained by volunteers, and are intended to be taught by one or more instructors (also volunteers). Each lesson is also suitable for self-study. All the course materials are freely available online under a permissive use licence (CC-BY) and can be reused and remixed if needed. 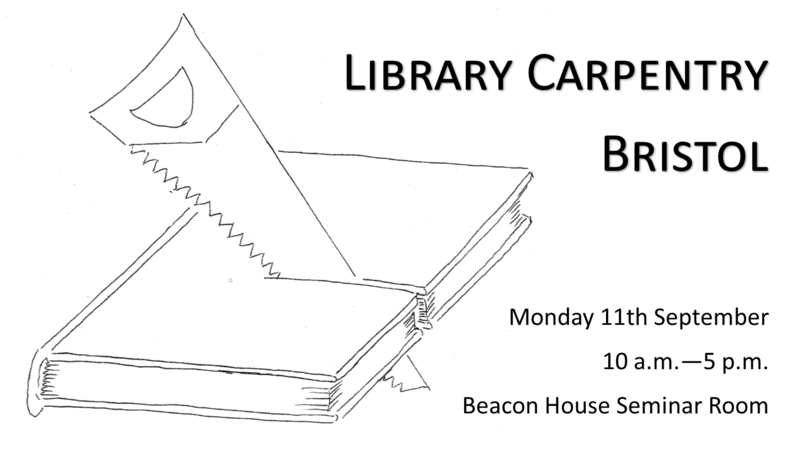 Library Carpentry is an offshoot of Software Carpentry and Data Carpentry (the latter are aimed at academic researchers) and follows the same basic lesson structure – short introductions to key concepts followed by examples to work through to solidify learning. The tools and software packages taught are typically open source to maximise opportunity of use. Naked self-interest! Bristol Research Data Service staff were keen to learn more about data manipulation techniques, and an informal poll of the GW4 Alliance Data Services Working Group showed that there was interest in other local institutions as well. We ended up advertising the event to all GW4 and AULIC institutions. We asked potential attendees which modules they would most be interested in, and on that basis selected the Introduction to data and OpenRefine lessons. Library Carpentry has a very active Gitter group, so after submitting a plea there and contacting the organisers of past workshops (thank you to Tabitha Witherick!) we had two instructors volunteer: Dave Rowe (introduction to data) and Owen Stephens (OpenRefine). We also needed helpers: people to assist on the day with general troubleshooting (for example, network connection issues). We had volunteers from both library staff and IT Services across Bristol, Bath and UWE. It’s safe to say that the workshop would not have run anywhere near as effectively as it did without them, so thank you very much to all the helpers – and of course, our instructors! Over seven hours we covered the two chosen modules, with time for questions, general discussion and working through examples using library-related data. Feedback from attendees has so far been excellent, with several people indicating that they’ll be using OpenRefine for specific tasks the near future, and even teaching colleagues how to use it. At Bristol we had several requests for a second workshop from people unable to attend the first one; whilst another formal workshop might not be possible, we’re looking into a ‘flipped classroom’ or collaborative learning approach of short 1-2 hour sessions to pass our learning on to other colleagues and keep our skills fresh. All in all, it was a very useful day, and we’d highly recommend attending or hosting a Library Carpentry workshop if you have a chance. Kopernio is an extension for your internet browser that quickly tells you if you have access to a version of the journal article that you are looking at. 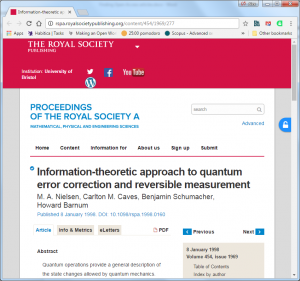 It detects when you are looking at an article’s page and, if you have access through either the library’s subscriptions or through an Open Access version, it will provide a link to the document. The extension also keeps a record of articles you downloaded so you can find them again easily and can export a list of references to a .bib file for use with BibTeX. The video gives a good indication of how the extension works. Why not try it out next time you’re looking for journal articles? The extension will work in Chrome or Firefox. Edit: This extension was previously known as Canary Haz. We have updated the information here to reflect the new name and website. You’ve seen DOI numbers before. But did you know that you can use them to link to Open Access versions of articles? You can use a DOI to find a paper by pasting the DOI into the following format: https://doi.org/XXXXXXX. But, the above journal article is on a publisher’s website which hides the full text behind a paywall. You may have access thanks to the subscriptions provided by library services. 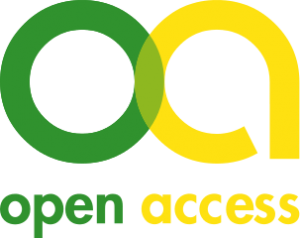 But if not, you can try using Open Access DOIs to find an open access version. This looks for any Open Access versions and, if it finds any, it links you to one of them, rather than the publisher’s site. This is a good trick for finding an Open Access version of an article you already know. It can also be a good way to link your readers to an open version of your work, ensuring they can read it. We talk a lot about uploading your articles to Pure so other researchers can benefit from Open Access. But we rarely talk about how you can use Open Access to benefit your own research. In this series of blog posts, we’ll show you some simple ways to find Open Access articles. First up: Unpaywall. The open padlock icon on the right hand side of the page shows that an open access version is available. Clicking the icon will take you to the article. You’re searching for useful papers for your research. But the library can’t afford a subscription to all the journals you need. Papers hidden behind paywalls are a constant frustration. You could ask the library to get copies for you, but you’re on a tight schedule. You’d rather get that paper now. Unpaywall is the solution. This browser extension adds an icon to your screen that lets you know if an Open Access version of the paper you’re trying to view is available. Click that and you’ll be reading the full text in seconds. You can add the extension to Google Chrome or Firefox, even on university computers. Once you do, it’s always on and checking to see if it can provide a link to an Open Access version. If so, it’ll add an unobtrusive open padlock icon to the right of the screen, which will take you to the full text.